Ok I must admit that Hong Kong is not really my first choice in terms of travel destination. Put it simply- I don’t really like dim sum, roast meat and noodles. (Oh oh) Then you must be wondering why I even went there. To enjoy other food Hong Kong has to offer of course. You will be surprised that there are a lot of cafes, dessert shops that are springing out each day. Anyway whenever I go back to HK, I HAVE to dine at ADC to satisfy my scrambled eggs craving. The eggs are so silky and fluffy, we went back on 3 consecutive days. Breakfast, Lunch and Supper. Hahas Though there is always a queue in the morning, the line moves pretty fast. Considering how they pack diners like sardines ( You always have to share a tiny space with other diners). They also churn out dishes as fast as they clear them so don’t be taken aback. Good food usually comes with a little tolerance, We find the prices there super reasonable. 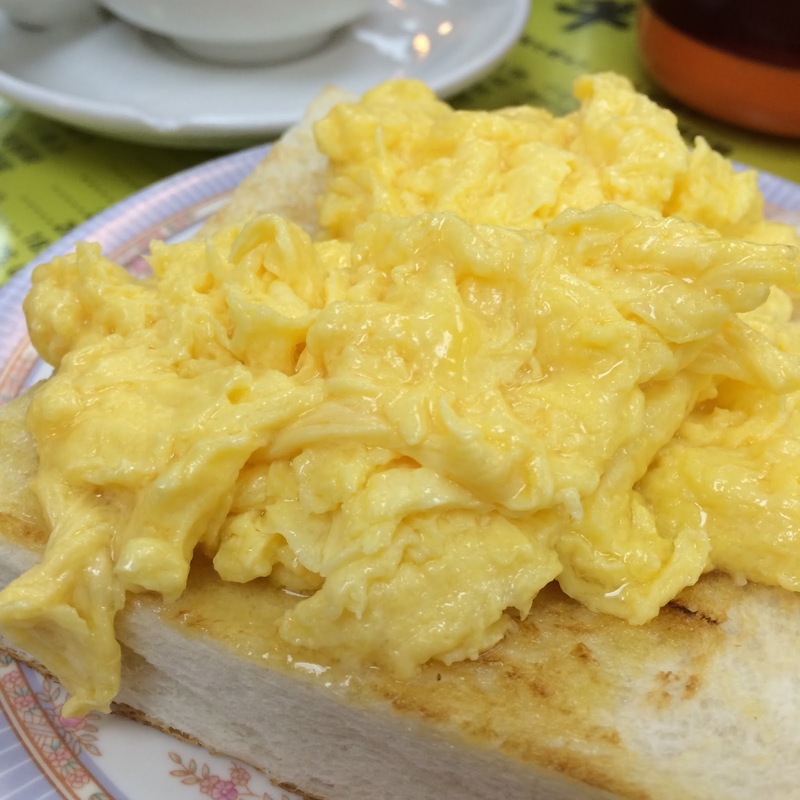 They offer lunch sets (the locals usually order this) at HKD36 – SGD 6.50 which consists of a macaroni soup, toast with eggs of your choice and a drink. Mak is no stranger to most of you wanton noodle lovers. Infact they even open up a few branches here in Singapore so you don’t have to travel all the way to Hong Kong to enjoy a bowl. Mak is well known for their wanton soup noodles. 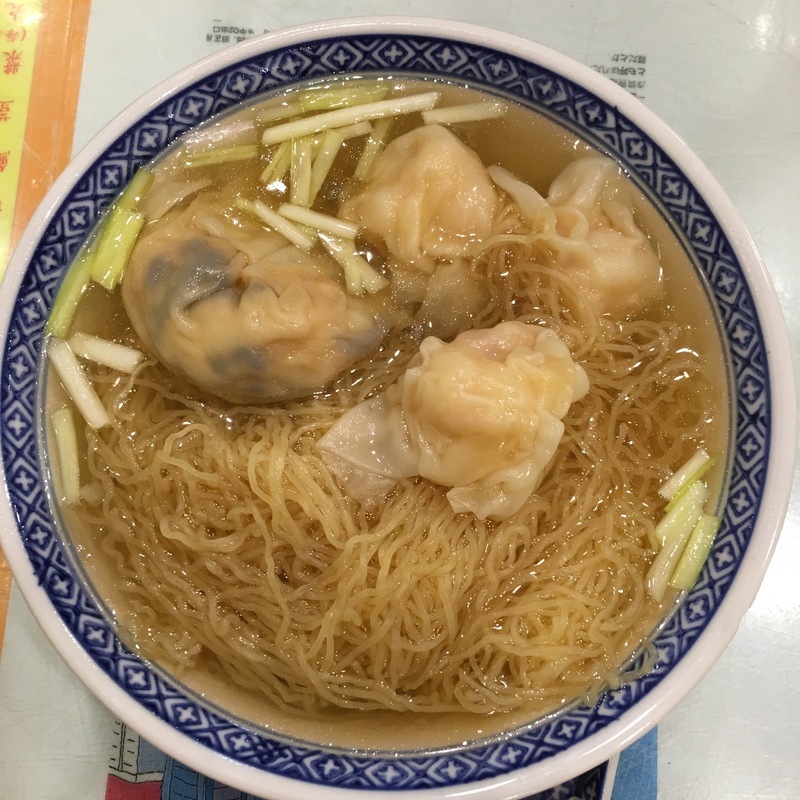 Noodles are springy and thin and the wanton is fresh and succulent. We tried their dumpling soup and was not disappointed too. The prawns inside were generous, bouncy and fresh! There are a few outlets around Hong Kong but the most convenient one was located 2-3 stores down from the famous Australian Dairy Company. 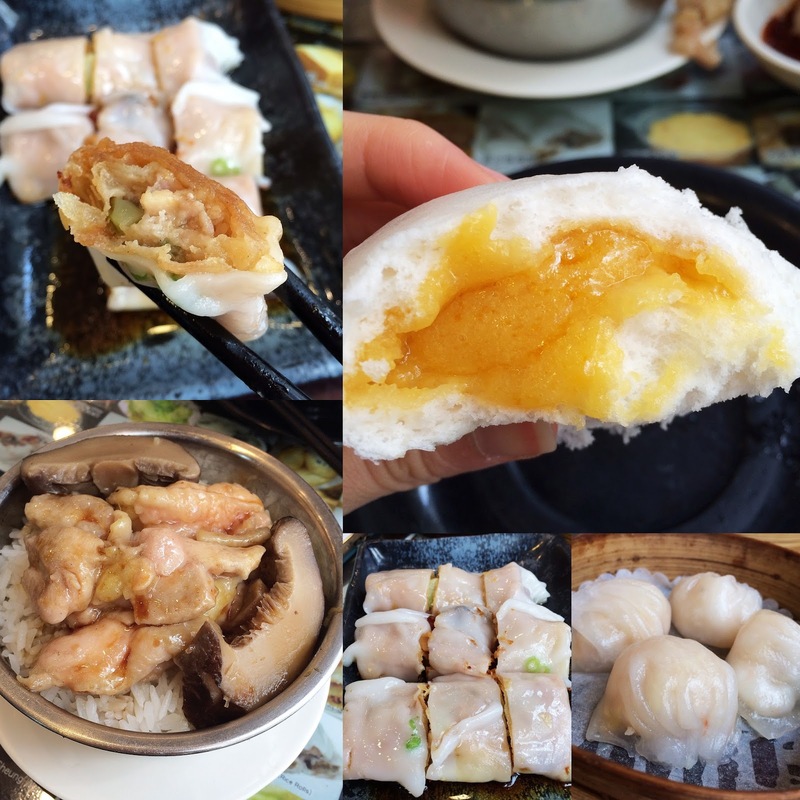 There are so many Dim Sum stalls in Hong Kong, it is hard to pick a favourite to go too but Dim Dim Sum serves a good and reasonable price Dim Sum. If you order and dine btw 2.30-6.30pm, you get an additional 30% off your bill. And the food there is not really ex to begin with. Though they may seem pretty small for a dim sum shop, the number of people visiting this place is impressive. They always have a queue. We went pretty early like at 9am to find that they actually opened at 10am. But it was a good thing we arrived earlier as very soon the place was pretty packed. 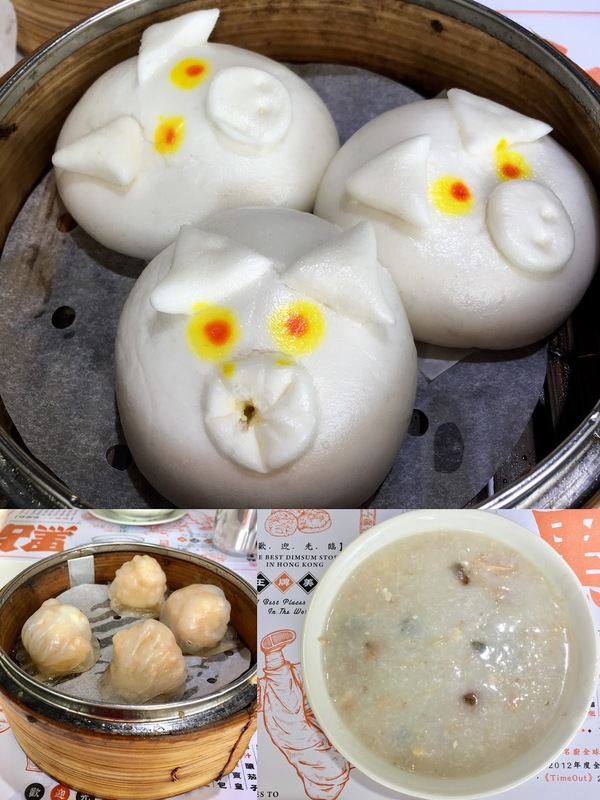 The har gaos were fresh and juicy, the liu sa bao was flowy just the way we love it, the steamed chicken and mushroom rice was fragrant but the best thing we ate there was the chee cheong fun that was stuffed with crispy spring roll. It was so good. We only had that much stomach space for dim sum but it was definitely worth the visit. We walked hills, slopes and stairs up down to find this place. It’s not a hard place to find because the moment you notice a line outside the restaurant. That is it! I see many taxis dropping off passengers who came here specially for the beef brisket. Although the queue is long, like all other popular HK restaurants, the queue actually moves quite fast. It took us like 15-20mins to get to our table. We ordered their recommended beef brisket kuay teow soup and curry beef tendon noodle. The beef brisket is so tender. Do note that there is a minimum spending of HKD40 per head. This is a one michelin star restaurant and is well known for their great variety of roasted meat, dumplings and noodles. Always go early and order their roast goose drumstick because the skin is crispy and the meat is really succulent and juicy. Prices are not too steep considering it’s a one michelin star and well famous. 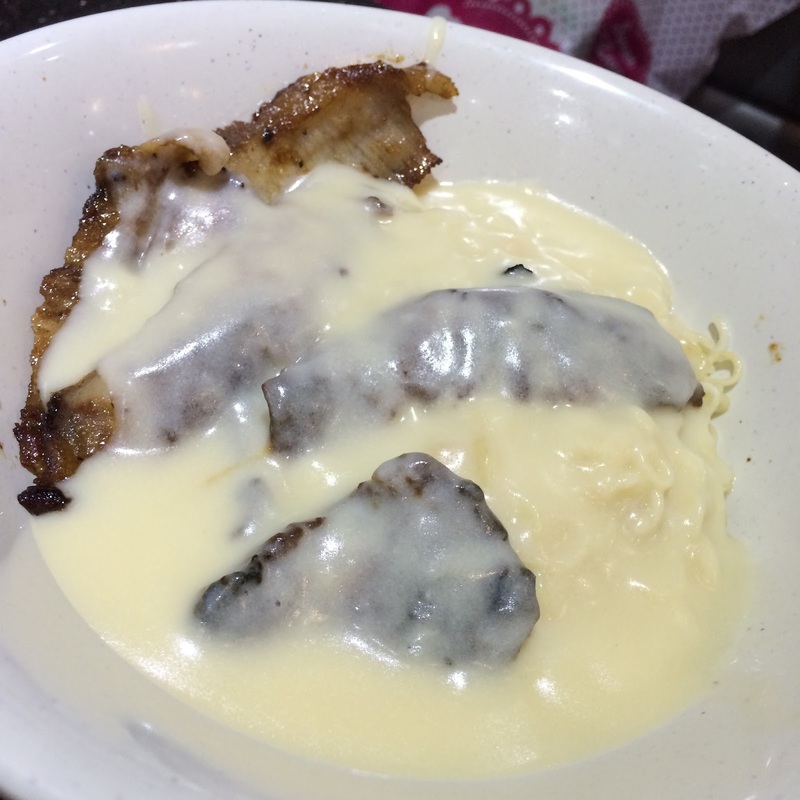 Sun Kee is famous for their grilled pork cheek cheese noodles. The meat is well marinated and tender but after eating a few mouthfuls the cheese started to get quite jerlak. Best to share with a friend. You definitely won’t miss this chain because it is at every nook and corner of Hong Kong. They are famous for their mango, fruit desserts. What got us hooked is their watermelon aloe vera and jelly ice blended drink. HKD 27 We went back 4 times to get that. If you’re passing by, you may want to try one of those or their signature mango pamelo sago dessert. Too many varieties to choose from. The first time I went to Jenny Bakery, we went to the branch at Sheungwan. People started queuing 1 hr before the shop was even opened. We didn’t want to wait in line in the scorching sun so we passed. I heard from friends that the outlet at Tsim Sha Tsui was less crowded so on our 2nd visit to HK, we visited that one and there were only like 4-5 peeps infront of us. 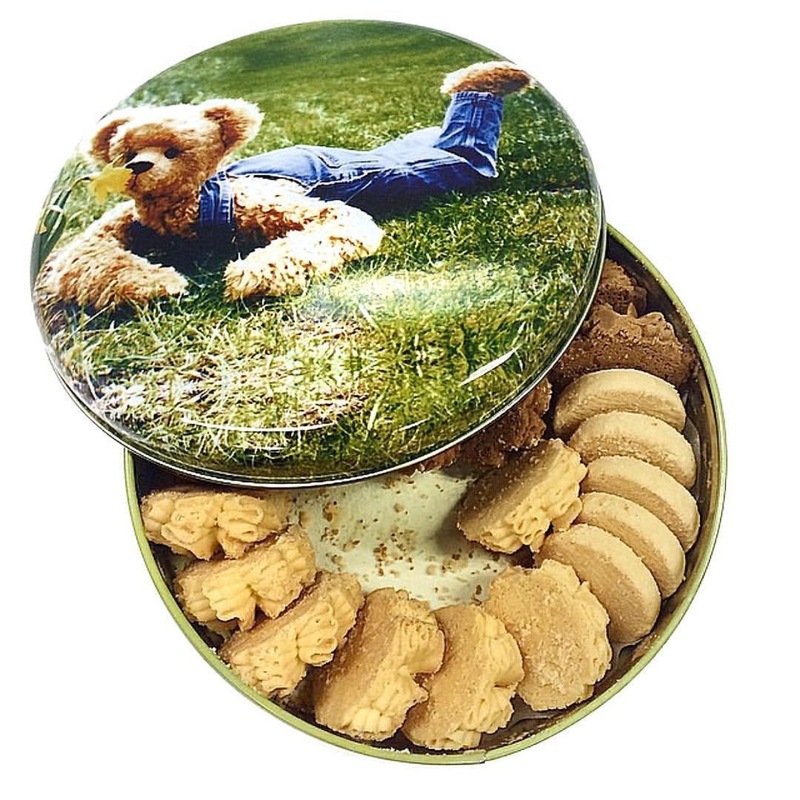 They sell their biscuits in boxes so the line moved pretty quickly. If you like buttery melt in your mouth butter and coffee cookies, you will like this. I found them too buttery for my liking but friends seem to like them. Someone posted this cheese tart on Instagram and I was so amazed by the selection of tart flavors and cake variety that I told myself I needed to pay them a visit. Fortunately I was not disappointed. The cheese tarts were warm when we had them and they flowed like lava….. Whoohoo. It’s more flowy then Bake cheese tarts from Japan. They are only available from 12.30pm and they come in original, matcha and chocolate flavors. Besides their tarts, they are also famous for their mini cheesecakes which come in boxes of 5 and 10 and at the counter there are a lot more variety of cakes. BEAUTIFUL cakes that make you wanna dig right in. What stole our hearts first was the double matcha formage cake which resembled a light and fluffy Japanese cheesecake with mousse like texture. Nestled in the middle of busy Mong Kok is a stall that sells Cheese tarts and funky drinks. They have so many varieties of tarts that we were quite confused as to which we should pick. In the end we settled for taro, matcha, potato bacon and original. Sad to say, none of them tasted as good as the best ( Bake from Japan and Pablo). They are decent but lacking in the cheese flavor. But then again if you’re around the area and suddenly have a cheese tart craving, these should do fine. 33 Dundas St, Mong Kok. GAWD! The gigantic cheese buns here have to be the highlight of my entire trip. Words just can’t express how good they were. If you like Barcook’s cream cheese raisin buns, the buns at Guschlbauer will send you straight to heaven. I think they stuff like 5 times the amount of cheese you get at Barcook in a bun. Every bite leaves cheese oozing out from every corner of your mouth. We tried the original Austrian Cheese bun as well as the Melon Yogurt Bun. Quarter of a huge bun cost only HKD25~ SGD$5. Those flavoured ones go at HKD 27. 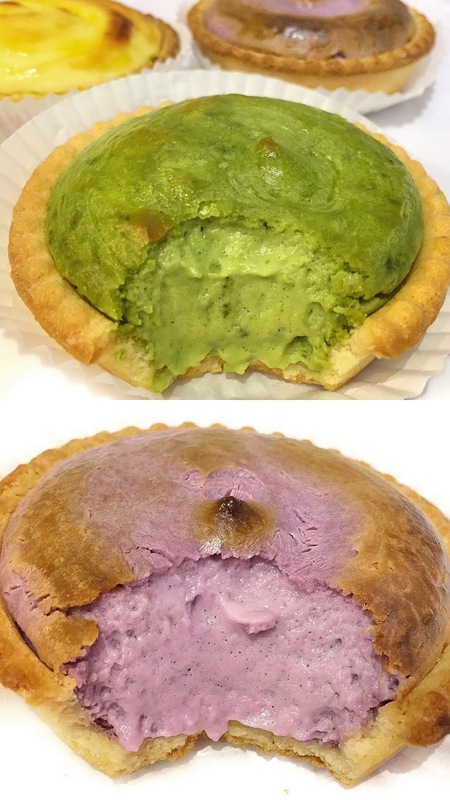 They are also famous for their japanese sweet potato buns which come in a striking purple color. This one needs no introduction. 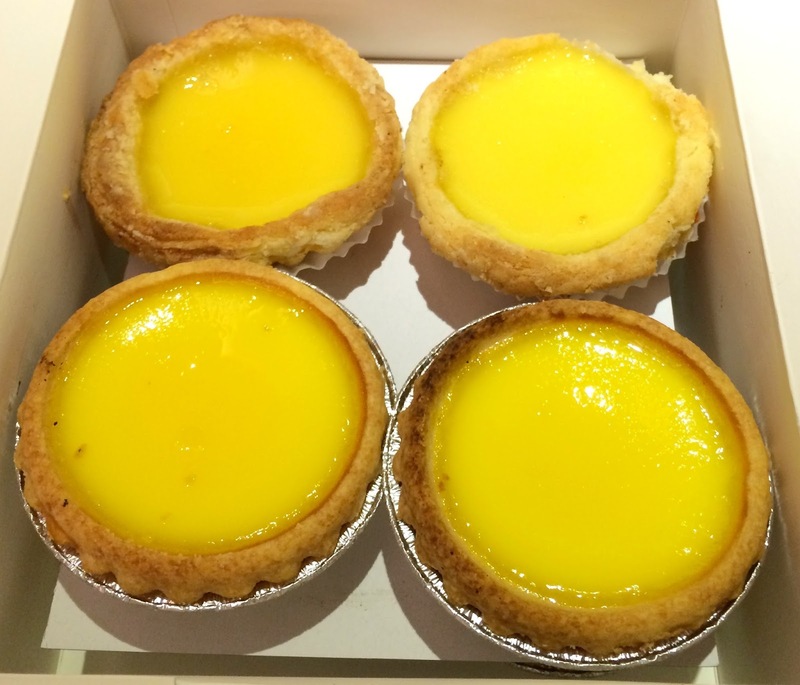 Hong Kong’s legendary egg tarts that have also invaded the shores of Singapore causing a massive bottleneck at Takashimaya Basement. We have tried both the ones in HK and Singapore and the HK one is still slightly better. Buttery shortcrust pastry and silky smooth custard egg filling. When you eat it warm from the oven, blisss I tell you. This is a must go for all matcha lovers. We chanced upon this shop while walking along the streets of causeway bay. Nah actually it was part of our itinerary but we did not make an extra effort to find it. Which after trying, we had absolutely no regrets! Their best seller Matcha soft serve with matcha ice blended frap left us speechless. Their soft serve was creamy smooth and indeed very matcha. The ice blended frap was slightly sweeter but the taste of Matcha was there and complemented the soft serve really well. If you like cheese cake, you can try their uji matcha cheesecake too. Their cheese is more on the creamy moist side with a sponge base.